The Making Headway Summer 2017 Newsletter is Here. 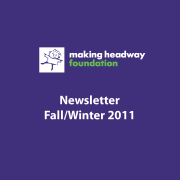 Featured articles include new research grants, the new MakingHeadway.org website, “Something Magic”, Head to the Hill, “Why I’m Doing My Part”, new partnerships, and so much more. Do view the newsletter, visit https://goo.gl/1fV8ei or click here.